An online master's program can help propel an individual's career in computer science or can serve as a bridge for those who have been working in another field and want to try something new. Even though many computer science jobs do not require formal training to start, a master's degree may be necessary for those who choose to pursue a promotion, raise or management position in the computer science industry. Find programs, see what the online master's degree in computer science timeline looks like and learn more about possible career paths below. 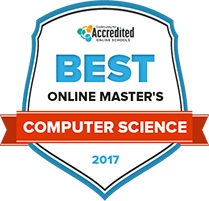 A great way to begin your search for an online computer science master’s degree is by checking out the following rankings. While there are many ways to rank a school, this list is based on practical, real-world factors, such as student-to-faculty ratios, tuition cost, opportunities for financial aid and program offerings. A master’s degree in computer science at Carnegie Mellon can take many different forms, each of which is flexible to meet the desires of students. Students have the option to get their computer science degree in one of multiple fields. Those new to Carnegie Mellon can expect to finish their degree in just three semesters, preparing them for a career in a short amount of time. Also, a master’s in computer science almost solely consists of coursework, so students who want to avoid research programs will be able to at Carnegie Mellon. Rochester Institute of Technology’s computer science program is flexible to meet the needs of students who might be busy during the day. The program accommodates part-time students that might not be available during the day. Because of this, most classes are offered in the evening or at night. However, full-time students will be able to study throughout the day to finish their degree in a shorter amount of time. A computer science degree consists of clusters, specific areas of studies that students can specialize in, as well as electives that are more normal to computer science programs. Students that are interested in research rather than coursework will appreciate the course structure at DePaul University. The research programs available to students pursuing a computer science degree are numerous and differentiated, so there is often a fit for all interests in the field. However, DePaul also offers courses that place a smaller emphasis on research, giving students the opportunity to further explore subjects they enjoy. The curriculum at DePaul also focuses on the constants of computer science and focuses less on the ever-changing sectors of the field, making sure students are secure in the fundamentals of computer science. A master’s in computer science at Illinois Institute of Technology can take multiple forms, depending on what the student is looking to get out of their education. The computer science degree can come with specializations, giving students broader knowledge in a specific area they might enjoy. However, these specializations are not required for all computer science degrees. Students that would prefer to study and practice coursework rather than focus on projects will find Illinois Tech’s curriculum fitting since a senior project is not required for any type of computer science degree. The University of Southern California’s computer science program is structured to give graduates the freedom to pursue whatever they would like after earning their master’s degree. It isn't uncommon for some students to return to further their studies, and the rest are prepared to enter the professional realm of computer science. Also, USC’s computer science program offers plenty of different specializations, each of which is different enough from the other to give students a distinct advantage when looking to begin their career. Coursework with a focus on both fundamental and theoretical computer science practices. By combining both fundamental computer science and theoretical changes that are evolving the field, George Mason University prepare their students for success. Wherever a student may want to go after earning their computer science degree is up to them, since the course structure is designed to allow students to study their interest. Students have the option to spend more time on project-based work, or they can opt for more coursework depending on what their interest is. George Mason also offers afternoon and night classes to accommodate busy schedules of computer science students who need the flexibility. All degree programs in computer science at New York University place a heavy emphasis on the fundamentals of computer science rather than the theoretical. As a result, students who earn their computer science degree at NYU are well prepared to begin a career as a computer scientists or software developer at major companies. Most courses are structured to teach students how to combine their computer science knowledge with business aspects to make an impact in different industries. Other students go onto further education and work toward becoming faculty or staff in the field. There are multiple master’s degrees that students can work toward in the computer science field at the New Jersey Institute of Technology. Each degree can either lead directly to a career in computer science or toward a furthering of education. NJIT also has a comprehensive online program for the degree. Students are able to take classes in person, entirely online or as a combination of the two. Research opportunities are also made available to students who would like to focus their studies in research, but they are not required to earn a degree. At Northeastern University, students will be prepared to enter the professional work force after completing their master’s degree in computer science. To ensure that students are prepared, the course structure at Northeastern gives students the option to choose from any number of concentrations. These concentrations are meant to teach students more about their desired field. The curriculum combines all aspects of computer science, making sure that students have a comprehensive understanding of computer science by the time they earn their master’s degree. Northeastern also places a heavy emphasis on the senior thesis, making projects an important part of study alongside coursework. In Purdue University’s master’s program in computer science, students take both traditional classes and seminar-style classes where students investigate current research. The online master’s program allows students to earn a non-thesis degree completely online while the Information Security for Computing professionals is designed for current industry professionals who want to pursue a higher security position. An on-campus master’s helps graduates pursue a variety of careers and these students have a number of options for degree completion. Internship and financial aid opportunities are available for all students. Aspiring students can sort through a comprehensive list of schools offering online master's in computer science degrees by using the search tool below. Filter by your individual needs that matter most, such as school size, cost and location, to help find a program for you. A master's in computer science degree consists of around 40 credits and will usually take two years to complete; accelerated programs, however, may take less time. Earning an online master's degree in computer science begins with gathering the necessary elements for the application process. See what a full-time, two-year timeline looks like below as well as some tips on how to complete the application process. The steps for admission into computer science online master’s degree programs may vary, but there are several consistent factors. The application process is where a student highlights previous academic success and qualifications, so it is important to a well-thought-out application package. The steps below give an overview of what applicants should expect during the application process. In order to be accepted into an online master’s program in computer science, applicants must have a bachelor’s degree. Few schools will require a bachelor’s degree in a certain area, but will require incoming students to have the necessary training and background to understand the high-level computer science instruction they will receive in a master’s degree program. This can be proven through official transcripts from the undergraduate institution. Assuming the student doesn’t have a bachelor’s degree in computer science, information technology or similar area, they will need to gain proficiency in computer science subjects. It is necessary for students to have this foundational background in order to pursue a master’s level degree. These courses can be taken before admission; those who have not completed them might be able to fulfil the required courses in their first year of the master’s program. Some schools see GRE scores as being optional, but many will require it. The GRE is one of the elements of the application that will require careful planning by the applicant since the test can only be taken on certain dates, and the process of sending scores to the institution can take several weeks. A prospective student’s undergraduate GPA is a very important component of an application. Many schools offering a master’s in computer science have a relatively high minimum GPA for applicants, such as 3.2 on a 4.0 scale. Please review your desired program’s GPA requirements for specification. The statement of purpose provides an opportunity for students to share why they want to get an online master’s degree in computer science and what their professional goals are. This is an opportunity to be more than just a name on an application form; this is where aspiring students can truly shine and capture the attention of the admissions panel. Prospective students should start by choosing a recommender who knows the applicant’s skills and is willing to vouch for those skills; this might be a former professor, a current colleague, a supervisor or someone else who has in-depth knowledge of the computer science field. In addition, it is important to ask for these letters early in the process, thus allowing the recommender plenty of time before the application deadline. Depending on the student’s prior academic training and the particular program they are enrolled in, the first year typically focuses on core courses. The major learning objectives students may expect to complete during their first year are listed below. Some online computer science programs will require students to take introductory courses before enrolling. Other programs will incorporate these classes into the first year curriculum. These classes will usually cover topics like networks, operating systems, software architecture and databases. Core course are typically a short list of courses required for all students to take, regardless of background or academic preferences. These classes will vary depending upon the program, but can cover subjects like project management, advanced database systems and computer algorithms. Specialized courses will vary depending on the student’s chosen concentration, but might include topics like artificial intelligence, parallel processing, data analytics and health informatics. Students will likely be required to select a specialization or concentration during their master’s degree program. The second year is where most students will complete their degree. During this year, students can expect to focus on the classes of their choosing, as well as any other program requirements, such as a thesis or capstone project. Computer science offerings vary by program, but may include such subjects as security, data analytics, computer networks, systems and control engineering, artificial intelligence and pervasive computing. Students will usually take several courses in their concentration as well as a few chosen electives that can help them further tailor their education. For some students, core courses are often completed during their first year, especially if they enroll with transfer credits that apply toward their master’s degree. However, many students will take the last few core courses during their second year. Many master’s programs in computer science require their students to complete either a thesis or a capstone project. Though work on this might be touched upon during the first year, the serious work usually will begin during the second year. The thesis and capstone project provide an excellent opportunity for students to gain research and writing skills as well as explore new areas of computer science. Most schools will expect their students to maintain a required minimum GPA of around 3.0 on a 4.0 scale. Sometimes the minimum GPA required per course can vary depending on whether the course is a core course, an advanced course or an elective. For programs that require a thesis, students will need to find a topic, design and conduct the research, and then write the paper for a presentation of their findings. Students can expect to receive several academic credits that count toward their graduate credit total. Students who have enrolled in programs that require a capstone project typically implement what they have learned in a research and/or real world project. The capstone project will often represent a culmination of all the student has learned in their online computer science master’s program. A master's degree in computer science is flexible in that it can typically prepare graduates for both technical and conceptual roles. On the technical side, it can provides practical knowledge that prepares students for hands-on work in the computer science field. On the conceptual side, it can provide advanced and specialized knowledge and training for graduates seeking management and leadership careers. A few career statistics of the possible jobs for graduates are listed below. Generally, computer systems analysts are consultants for organizations with computer systems. More specifically, computer systems analysts review an organization's information systems and provide recommendations to help the organization's information systems operate more efficiently. Senior software developers help create software and oversee development. Depending on the particular job, software developers may focus on design, creation, implementation or testing software. Senior software developers take a more management-oriented role and oversee software development to ensure it is coming along as scheduled and according to specifications. Database administrators work with information systems with a particular focus on information and data management. Common job tasks include protecting customer and company data, organizing data into databases for more security and ease of access, maintaining databases, and implementing and testing databases. As a result of the open nature of the computer science master's degree curriculum, students may have the option of taking specialized and unique courses. They may choose to do this out of a natural desire to learn more or because focusing in a particular area improves their professional growth. Depending on the program, students may specialize in areas such as networking, big data, security and database management. For those who are already in the computer science field, a master's degree can be a stepping stone toward advancement in the industry. A comprehensive master's curriculum can enhance the knowledge an individual already has or can offer an entirely new slant on a field that may allow them to broaden their employment horizons. In addition to gaining specialized knowledge in a particular subfield of computer science, many master's degree students will gain valuable skills to take on leadership roles within the field. For example, students may learn how to predict the cost of software development, ensure product quality and properly make risk assessments regarding the feasibility of project completion. Universities are bastions of research, meaning some of the newest advancements in computer science originate from universities that heavily foster research from both students and faculty. Therefore, students may have the opportunity to witness cutting-edge technology and theories. This first-to-know advantage can provide students with another way to get ahead in their professional careers. ACM's mission is to foster collaboration among all participants in the computing discipline. Through local chapters, the ACM works to enhance the professional and educational aspects of computing. AITP is one of the most prominent professional organizations for those in the information technology professional and academic industry. AITP is dedicated to improving information technology's place in society and how it is taught. IEEE is a leading computer-based organization focused on promoting all aspects of computer science and technology. It is comprised of members across various disciplines, including educators, engineers, researchers and students. UPE is an international honor society dedicated to recognizing academic success among students at both the undergraduate and graduate levels.